Video demonstration shows machine bagging coarse solar salt into plastic open mouth bags with full flow and then a dribble. The plastic, open mouth bag is clamped onto the outlet spout of the machine. When the start button is pressed, the coarse solar salt is conveyed into the bag at full flow. When the contents of the bag get close to the target fill weight, the auger and conveyor slow down the flow to a dribble. When the target weight has been reached, the bag clamp is released and the plastic open mouth bag is ready for sealing. 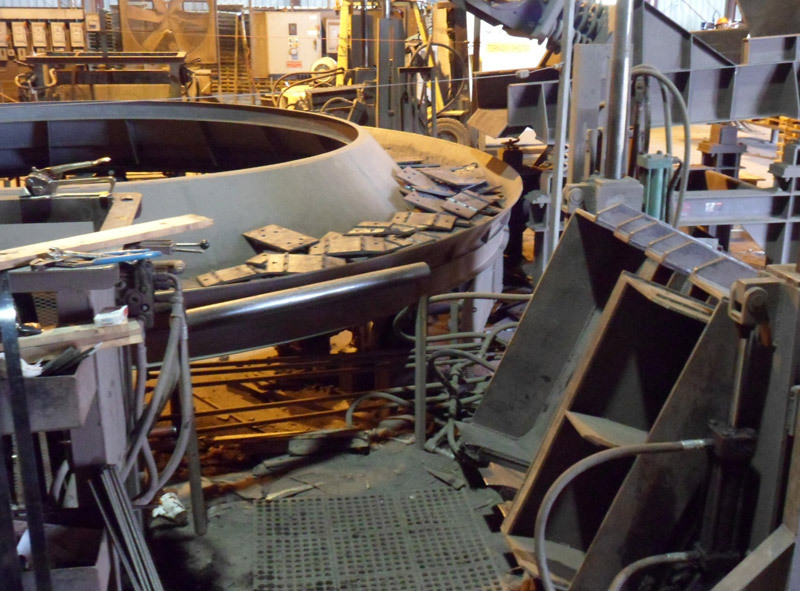 Curved or circular vibrating conveyors can be used to meter, sort or align material. Material is fed to the conveyor in bulk or by an existing conveyor. The material exiting the conveyor will be in a single or double line for the next stage in the process. In the picture shown below, the conveyor lines up 18 inch by 12 inch, 35 pound metal plates into a single file line to convey under a camera for inspection. This type of Vibrating Conveyor has a large pan and trough and is used to convey heavy, abrasive and very hot materials for bulk processing systems. They are also used to convey solids for a wide array of applications, including aggregates, minerals, rebar, sand, coal, ash, ore, castings, molds, pharmaceuticals and food products. Standard sizing options are available, as well as, custom-engineered products tailored to fit specific customer requirements. Vibrating conveyors also allow additional processes such as cooling, heating, sorting or coating to be accomplished while transferring materials. Curved conveyors can be added to an existing conveyor system. Conveyor speed can be adjusted to match in-feed and exit conveyor convening rate. Contact us to ask a question or get a price quote. 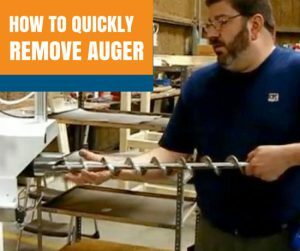 Watch a video and to learn How to Remove a Conveying Auger from a Valve Bag Filling Machine Machine. 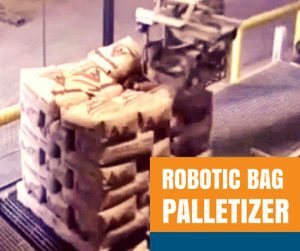 The Robotic Bag Palletizer can place valve bags and open mouth bags at a rate up to 30 bags per minute and is capable of placing pallets and slip sheets on pallets. It is ideal for handling multiple product lines at the same time. It can be designed around your plant layout with our standard bag filling line components. 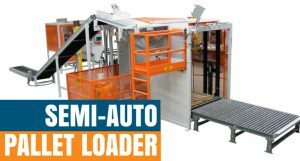 Semi Automatic Pallet Loading System quickly loads and stacks filled valve bags and open mouth bags on standard wooden shipping pallets at speeds up to 18 BPM. 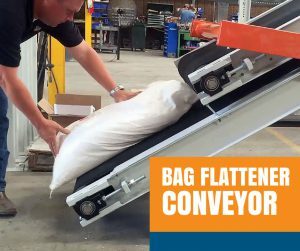 This Bag Flattener Conveyor will be used to flatten open mouth bags filled with Fertilizer before they are conveyed to a palletizer for uniform stacking. 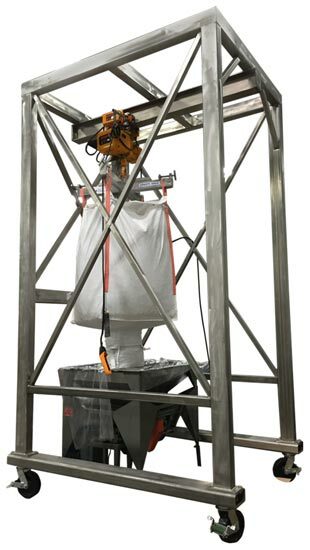 Portable Bulk Bag Unloader with overhead rail, powered trolley and powered hoist, bag lifting frame, designed for a typical 4000 pound bulk bag with bottom discharge. Unit can be moved in the process area to allow for unloading of bulk bags at mixing or batching stations. Locking casters prevent unit from moving during the unloading process. Unit can be supplied with a untie hopper and discharge spout for discharging into mixers or batching containers. Stainless steel or carbon steel construction is available. 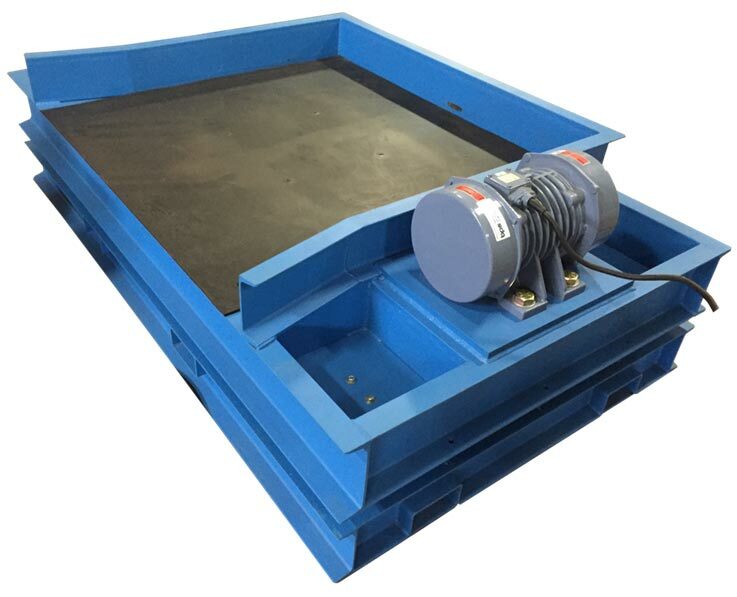 Portable Low Profile Vibration Table allows for insertion of boxes, bulk bags or other containers requiring densification. Unit is driven by an electric vibration motor mounted to side of table. Table is portable and can be moved around warehouse or plant site using a fork lift type truck. Top of table is covered with noise abatement rubber to reduce sound db level during densification. Included as an option is control system to operate the Vibration Table. It is available in stainless steel. 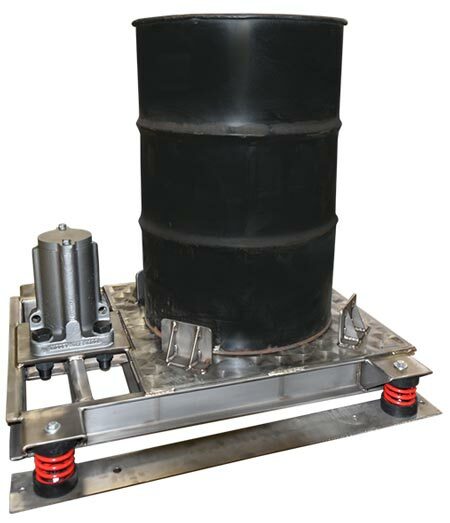 This compaction table is designed for vibrating 55 gallon or 30 gallon drums. It is constructed of 316 stainless steel to prevent corrosion and allow for wash down with water or chemicals. In includes an industrial air-powered vibrating drive and four isolation springs. Filled drum is placed on the vibrating compaction table. Compressed air is activated via included control cabinet to power the pneumatic piston to vibrate and shake the drum. This settles and mixes the contents of the drum. Unit is also available with an all-electric drive and control system. View more vibrating and compaction tables here. View case studies and solutions by Tinsley Company and others for many different industries.